Echols County’s first library was located in the city’s Methodist church, followed by the courthouse office of the school superintendent. Being a small rural community, the city of Statenville would have to wait many years for a permanent home for its book collection. Handsford Allen, a local timber and turpentine farmer, would help make this possible by willing funds to not only maintain the Boney Bluff Cemetery, located at Bethel Primitive Baptist Church, but also toward the erection of a public library. 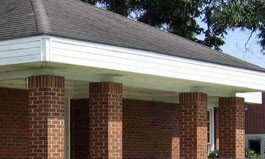 On July 19, 1992, the Hansford Allen Echols County Library opened its doors, the fifth and last installment in the South Georgia Regional Library system’s building blitz, funded by the state of Georgia. Marie Henderson was named as the first library manager. Mon, Tues, Thurs: 11 a.m. - 5 p.m.
Fri: 11 a.m. - 5:00 p.m. The old saying, “Dynamite comes in small packages” certainly holds true for this, the smallest library in the system. Located in Echols County, whose backwoods lore and legends fill the works of two of fiction’s giants, Janice Daugharty and Virginia Lanier, this neighborhood library has earned giant accolades for its outreach efforts. Art Program: Every Tuesday and Thursday from 3:00-5:00. Special Adult and Children's Author Book Signings: Done on a periodical basis and announced through various news sources. Children's Class: Please call 229-559-8182 for more info. Teen Book Club at 3:30 P.M. Join us as we read and discuss young adult books! Computer Classes Please call 229-559-8182 for more information.